Anemone 'Honorine Jobert' is one of those quintessentially English garden flowers, like red valerian (Centranthus ruber) and shrubby roses. I got used to seeing it in photos, but I rarely saw it growing in anyone's garden. The Perennial Plant Association chose it as their Perennial of Year for 2016, so I'm hoping it will become more popularly used. The whole point behind Perennial of the Year is to remind gardeners of some of the excellent, but underused plants on the market, like nepeta 'Walker's Low and geranium 'Rozanne', an overachiever in the flower department. The big plus for gardeners is that as demand for these plants grow, supplies increase and prices go down. Blooming from mid-summer throughout fall, Anemone 'Honorine Jobert' is free flowering and can self-seed, in good growing conditions. I've heard it called aggressive, but not invasive, however that depends on both growing conditions and hardiness zones. 'Honorine Jobert' has been grown for over a century. 'Honorine Jobert' was a sport of a pale pink Anemone x hybrida that was cultivated at the British Royal Horticultural Society's Chiswick garden in 1884, but this occurred in France. It wasn't long before she found her way back across the Channel to England. Leaves: Dark green, deeply cut leaves. Flowers: The buds start out fat and round with a hint of pink. Flowers are bright white with a green center disk encircled in golden-yellow stamens. They are 2 - 3 inches in diameter, with 6 - 9 overlapping petals. Some sources say Anemone 'Honorine Jobert' is hardy in USDA Hardiness Zones 4 - 8, however that can often depend on the weather. If winter is cold and windy with little snow cover, the plants may not survive. The same holds true if summers are excessively hot and dry. Plenty of water in summer and a winter mulch can help to keep your plants alive, but it may only be reliably hardy in Zones 5 - 7. You can grow Anemone 'Honorine Jobert' in either full sun or partial shade, however, white flowers tend to get washed out in bright light. For the best appearance, choose a spot in partial shade where the flowers will really stand out. The flower stems can easily reach 4 - 5 ft. tall and the plant will initially become a clump that spreads 3 - 4 wide. Anemone 'Honorine Jobert' is considered a fall bloomer. In most areas, it will start blooming in mid- to late summer and then continue on until frost. You should get at least 5 weeks of flowers. The white flowers are great for brightening up a shady garden or woodland. With branching stems, the flowers will ingratiate themselves throughout nearby plants and benefit from the contrast of pairing them with a dark green evergreen. Since they are late bloomers, you can interplant them with spring blooming flowers and bulbs. They will help hide the declining leaves of the early bloomers without crowding them out. Anemone 'Honorine Jobert' also makes a great cut flower. Soil: Any well-draining soil seems to be fine for growing Anemone 'Honorine Jobert'. It prefers a slightly acidic soil pH, but if you add some organic matter at planting time, your plants should be fine. 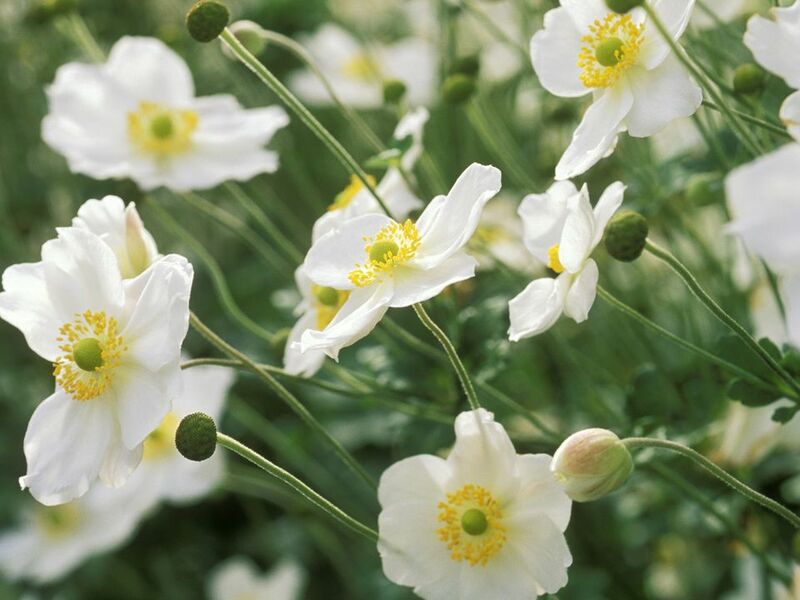 Planting: Although the plants self-sow, seed of Anemone 'Honorine Jobert' is hard to come by, unless you know someone with a few plants that have gone to seed. However, plants divide easily and also reproduce quickly from root cuttings. If you choose to divide yours, discard the woody parts and keep the younger, more tender roots. There are also often volunteer seedlings that can be dug and moved about or given away. Although it can take a few years for your plants to really become established, once they do, the roots tend to run by rhizomes and can become aggressive. I suspect once more gardeners start planting Anemone 'Honorine Jobert', we'll be seeing it often at plant swaps. Anemone 'Honorine Jobert' likes moist soil. If you can't provide that, at least give it some protection from hot afternoon sun. Other than periodic division in the spring and thinning out self-sown volunteers, the plants should take care of themselves. As fall bloomers, they tend to keep a low profile during the start of the growing season and may be late to emerge. If your plants grow tall and there are no nearby plants to support them, you may need to stake. There are no common problems.